Not long after the release of the next Harry Potter book, J.K. Rowling's Beedle the Bard, and in tandem with the newly announced release date for Harry Potter and the Half-Blood Prince, San Francisco will enjoy an influx of Harry Potter fans from around the world for AZKATRAZ - a four-day conference focused on the novels, the films, the sports and games, Wizard Rock, fan creativity and, for the first time, The Business of Harry Potter, Inc. AZKATRAZ will be the sixth event put on by HP Education Fanon, Inc. the nonprofit group behind Nimbus 2003, Lumos and this summer's Portus. It's scheduled to take place from July 18 through the 21st in San Francisco, and attendees will be able to travel with fellow Harry Potter fans from AZKATRAZ to Comic Con in San Diego on July 22. 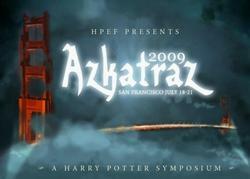 Not long after the release of the next Harry Potter book, J.K. Rowling's Beedle the Bard and in tandem with the release of Harry Potter and the Half-Blood Prince to movie theaters and in IMAX format, Harry Potter fans from around the world will converge on San Francisco for AZKATRAZ (http://www.hp2009.org) -- a four-day conference focused on the novels, the films, the sports and games, Wizard Rock, fan creativity and, for the first time, The Business of Harry Potter, Inc. The team of organizers brings together our twin populations of academics and fans in perhaps our most exciting matchup yet. Our theme, "The Choice Between What is Right and What is Easy," brings the dual backdrops of Alcatraz and Azkaban to the forefront of the real issues of social justice, gender equality, tolerance, and due process, as they are reflected in the Harry Potter books and the larger contexts of fandom and the world around us. Andrew Slack of the HP Alliance will be one of the featured speakers on this topic (http://www.thehpalliance.org/). There will also be programming focused on the analysis and integration to canon of the forthcoming "Tales of Beedle the Bard" collections set to be published in December, 2008 by Scholastic, Bloomsbury, and Amazon. New to the 2009 HPEF symposium will be a one-day MPA program -- "Master of Potter Administration" -- which will focus on the ways in which Harry Potter has impacted business and industry, including marketing, online ordering, special effects, and more. The track will run alongside our regular programming, but will feature breakfast, a special luncheon speaker, and a brief networking reception at the end of the day. As with all our educational programming, HPEF will endeavor to make continuing education credit or certification available to anyone who attends. Our Informal Programming plans, as implemented by Lauren Johnson, Jodie Baird, and their excellent team, promise to provide endlessly diverting ways to understand and interpret Harry Potter's world and the world of fandom. Proposed events include a History of Wizarding Fashion Show, a ghost tour and Death Eaters' reception on Alcatraz (no Dark Mark required! ), a pre-event Mixer/Mingler on Friday night before our official start, the return of the highly successful Fandom Swap Meet, Common Room programming, and a special concert to "Wrock the Rock." The event will also feature at least one IMAX showing of Harry Potter and the Half-Blood Prince, which will be released during the conference's weekend. Also returning next year will be our continued Young Adult Authors' Readings series, Quidditch, the Ball, Podcasts, the Art Gallery and auction, cosplay, Cinematic Alley, "Diagon" Alley...and of course, the chance to see and hang out with all your fan friends. Formal Programming is headed by Emma Grant, NQ Donne, and Flourish, who among them have years of fandom experience, academic credentials, and writing credits. The event will be chaired by Lee Hillman, outgoing president of HPEF, who started it all as the chair of Nimbus 2003. HPEF events have traditionally attracted attendees ages 14 to 70 who are academics, librarians, musicians, journalists, lawyers, teachers, students, and parents -- but what connects them all is that they are Harry Potter fans.